Europe's Suzann Pettersen has apologised for her controversial behaviour at the Solheim Cup on Sunday. Pettersen said that a putt on the 17th green had not been conceded when the USA's Alison Lee picked up her ball, meaning the Americans lost the hole. She was widely criticised and has now posted on social media to say "sorry for not thinking about the bigger picture in the heat of the battle". "I've never felt more gutted and truly sad," added the 34-year-old Norwegian. 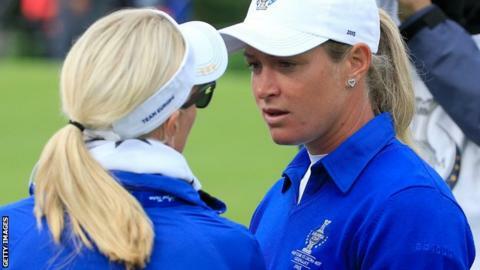 Four-time major winner Laura Davies said she was "disgusted" by Pettersen's action, while USA captain Juli Inkster thought it was "disrespectful". Pettersen was playing in the fourballs with Charley Hull against Lee and Brittany Lincicome when the incident took place, the European pair going on to win the match. The Americans thought the putt on the 17th hole had been conceded as Hull walked away after Lee rolled her ball close with the previous effort. The USA then recovered from 10-6 down to win eight and a half points from 12 singles matches to regain the trophy they last lifted in 2009. Pettersen added: "I was trying my hardest for my team and put the single match and the point that could be earned ahead of sportsmanship and the game of golf itself. I feel like I let my team down. "I have learned a valuable lesson about what is truly important in this great game." "Golf is a game governed not only by rules but a spirit of sportsmanship. It is a sport where players call penalties on themselves and where putts have been conceded when the biggest prizes are on the line. "Think back to Jack Nicklaus's concession to Tony Jacklin in 1969 with the Ryder Cup at stake. It was an eminently missable putt, more so than the one Lee would have been facing. "American Nicklaus picked up Jacklin's coin to ensure the overall match ended in a tie."